Often you will hear scientists, skeptics, and cheerleaders for science lamenting the sad state of scientific knowledge among the population at large, at least in the United States. We continually get the message that our children are not being properly educated in science as compared to other countries, and this leads to all manner of hand-wringing. However, as some recent research suggests, it may not be true. 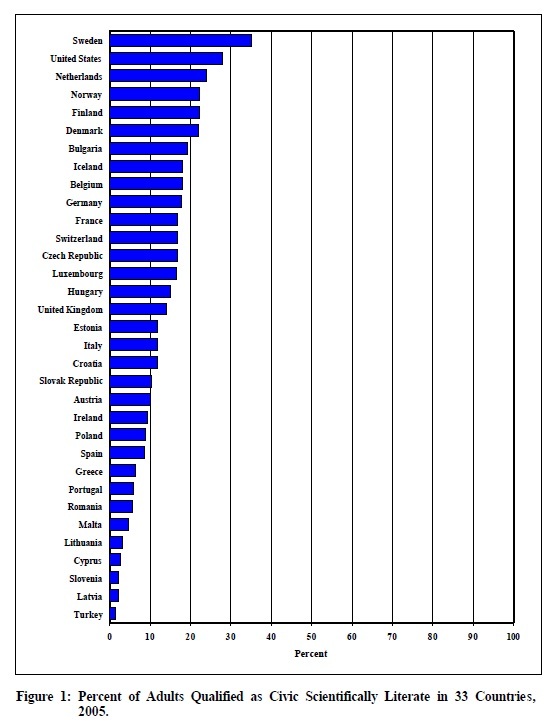 In fact, the state of science education and scientific literacy in the United States may actually be better than almost all other nations and – dare I say it? – getting better! Scientific Literacy: How Do Americans Stack Up? … according to a Michigan State University researcher, while Americans are holding their own, they are not even close to where they should be. Participating at 3:45 p.m. PST today in an American Association for the Advancement of Science symposium, titled “Science Literacy and Pseudoscience,” MSU’s Jon Miller said that Americans, while slightly ahead of their European counterparts when it comes to scientific knowledge, still have a long way to go. Now, I have to agree that an adult scientific literacy rate of 28% is unacceptable, especially at the beginning of the 21st century. However, the fact that we started out at around 10% in the late 80s (yikes!) and have almost tripled the scientific literacy rate gives me some real hope for the future of our species. I found out just this weekend that there is a grassroots movement in the state of Louisiana to repeal its so-called “academic freedom” law. Now why would anyone want to be against academic freedom? Because, plain and simple, these kinds of laws are nothing more than a front for pushing nonsense pseudoscience (specifically creationism) in public science classes. **Aside: For reference, Louisiana is currently the only state in the United States which has a so-called “academic freedom” law, but you can be sure that creationists have their eye on moving things in the same direction in other states (such as in Oklahoma, where a similar bill is under consideration). The big problem with the “academic freedom” language, which sounds good on the surface, is that it is intended solely as a vehicle to get non-science & pseudoscientific ideas into the public science classroom. In this sense, it is the latest variation on the old, debunked “teach both (all) theories” or “teach the controversy” tactics employed by creationists in years past. The intent behind the term “academic freedom” suffers from the same errors as these previous versions: it elevates blatant non-science (or pseudoscience) to the same level as established science, and this leads to all manner of confusion in students. Would we consider doing this in, say, a history class whereby we allow teachers the “academic freedom” to teach Holocaust denialism on an equal level with the well-established history of the Nazis & World War II? In my opinion, the “academic freedom” laws are even worse than their progenitors, because since they are so broadly worded (and not limited explicitly to science) they could be applied to any subject. Hence, my made-up scenario about Holocaust denial above could conceivably be protected under such a law, even though Holocaust denial is utter rubbish & nothing more than racist historical revisionism. Taken to the logical conclusion, such laws basically take the notion of objective reality and toss it right out the proverbial window. Building upon a grassroots effort last winter that was successful in fighting off efforts to insert creationism into Louisiana science textbooks, Baton Rouge Magnet High School Senior Zack Kopplin is helping lead an effort to have the Louisiana Science Education Act (LSEA) repealed during the Louisiana Legislature’s 2011 Regular Session. State Senator Karen Carter Peterson (New Orleans) has announced that she will sponsor the repeal legislation. 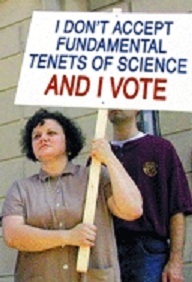 The misnamed and misguided Louisiana Science Education Act, which was passed and signed into law in 2008, is stealth legislation to encourage Louisiana public school science teachers to include creationist materials in their curriculum. In Livingston Parish Louisiana, school board members explicitly cited this law last summer in their push to mandate that creationism be made part of the science curriculum for the 2011-12 school year. It represents the the best thinking in American science, the best thinking in American religion, and it also reflects the United States constitution. Kopplin rightly views the legislation as costumed creationism – ridiculous Trojan horse legislation that lets instructors teach scientific “controversies” where none exist. He understands that when pseudo-scientific “supplemental” materials are used to critique scientific theories (such as evolution or gravity), a false balance results: ungrounded speculations are placed on par with the overwhelming scientific consensus. For more information, please visit www.repealcreationism.com and see our fact sheet. No doubt, this guy was expressing his disapproval of homosexuality – in fact, it seems he may have been involved in a hate crime, hence the photograph and media coverage. I’m also guessing, given the emphasis on the Bible, that this fellow’s also a fundamentalist Christian, someone who claims that they get their morality from a “literal” reading of the Bible. While hilarious, I think this points out something crucial in the mindset of most people who refer to themselves as Biblical “literalists”: they are, essentially, hypocrites. 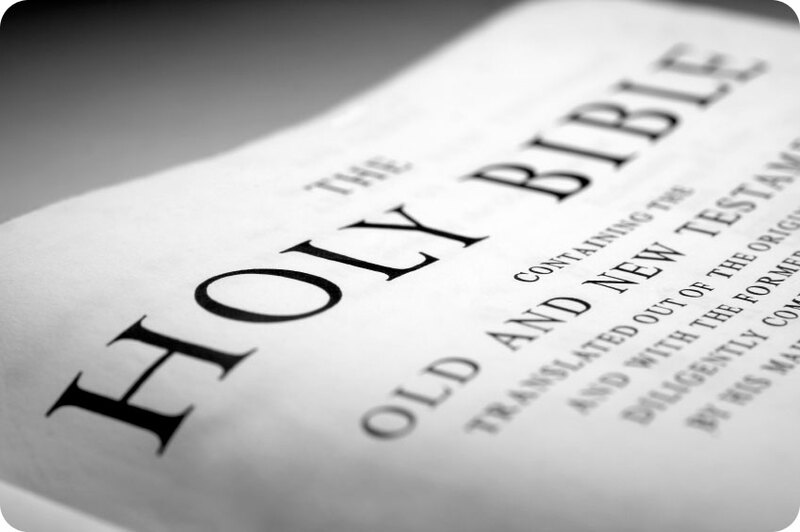 You see, most Christians who claim that mantle for themselves are just posturing, though they may sincerely believe it, because what they want is to have their particular interpretation of the Bible to take precidence above all others (including those of many other Christians). They are interpreting the Bible, just like anyone else, yet they refuse to accept that’s what they are doing. states it to be an abomination. End of debate. a) When I burn a bull on the altar as a sacrifice, I know it creates a pleasing odor for the Lord <NOBR>(Lev 1:9).</NOBR> The problem is my neighbors. They claim the odor is not pleasing to them. Should I smite them? b) I would like to sell my daughter into slavery, as sanctioned in <NOBR>Exodus 21:7.</NOBR> In this day and age, what do you think would be a fair price for her? c) I know that I am allowed no contact with a woman while she is in her period of menstrual uncleanliness <NOBR>(Lev 15:19-24).</NOBR> The problem is, how do I tell? I have tried asking, but most women take offense. e) I have a neighbor who insists on working on the Sabbath. <NOBR>Exodus 35:2</NOBR> clearly states he should be put to death. Am I morally obligated to kill him myself? f) A friend of mine feels that even though eating shellfish is an Abomination <NOBR>(Lev 11:10),</NOBR> it is a lesser abomination than homosexuality. I don't agree. Can you settle this? h) Most of my male friends get their hair trimmed, including the hair around their temples, even though this is expressly forbidden by <NOBR>Lev 19:27.</NOBR> How should they die? “Creationism Is True!” — Okay, Which Version of Creationism? A recent conversation on the comments section of this blog has caused me to write about a question that often plagues me when discussing the whole issue of creationism: namely, if creationism were a true & accurate account of the universe, which version of creationism is true & accurate? One of the biggest fallacies made by creationists seems to be that, in their apparent zeal to tear down the well-established science of evolution, they fail to realize that there are many different kinds of creationism out there. Not only that, but many of these differing creationist views are not compatible with one another, a fact which makes certain creationist claims to be “the truth” rather embarrassing seeing as how they conflict not only with modern science but other kinds of “truthful” creationism. And the fact that most of these people come to these conclusions through a supposedly “literal, inerrant and truthful” reading of the Bible opens up even more questions. In answer to that question, I think we shouldn’t really be scared at all. 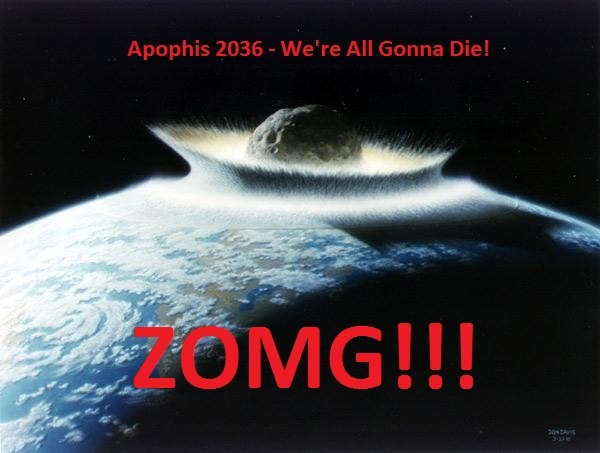 When you crunch the latest numbers, the probability that Apophis will actually impact the Earth in 2036 is about 1-in-250,000. If you work that out to a percentage, it comes out to a 0.0004% chance the asteroid will hit Earth. That’s a pretty slim chance, and certainly nothing to get all upset about, in my opinion. So that means that you are about twice as likely to die by being suffocated in a plastic bag as compared to the chances that this “killer” asteroid Apophis will wipe out planet Earth. Stop and think about that for a moment… now, are you suddenly going to start demanding the recall of all plastic bags from society in order to protect humanity? No? Good. Now, please don’t get me wrong – I think the issue of tracking & cataloging near-Earth objects (NEOs) is a very important one, precisely because we have solid evidence that NEOs such as asteroids & comet fragments can and do hit the Earth. In fact, this happens all the time, but the regular impacts are from smaller objects; the big, “planet-killer” type objects are fewer in number so the chances of one coming our way is comparatively small. But it could happen, and with the implications being what they are (i.e., the destruction of human civilization on Earth being among the worst-case scenarios) it would be prudent for us to invest at least some resources into these questions. And we have invested such resources into NASA’s NEO Program. So, in conclusion, is the sky falling with regards to Apophis? No. Should you go buying your own “asteroid apocalypse” bunker? No. Should we then turn a blind eye to the potential threat of NEOs? No. Should we invest a reasonable amount of money into researching this issue? Yes. Interestingly enough, one thing we really can do when Apophis makes its closest approach to Earth in 2036 is use the opportunity to learn more about asteroids and the early solar system. In fact, some scientists already have plans to use Apophis as an amazing research opportunity! If you’d like to know more about Apophis, and the related physics & astronomy behind it, I suggest taking a look at this entry over at Phil Plait’s Bad Astronomy blog.